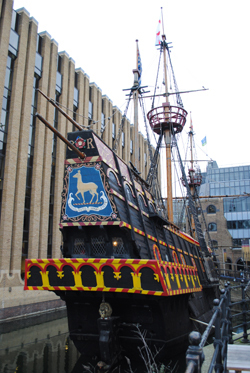 One of the foremost seafarers of the Elizabethan age, Sir Francis Drake became the second sea captain to circumnavigate the globe when he did so in his renamed vessel, The Golden Hind, between 1577 and 1580. While it is not believed he was a member of the Middle Temple – one of the Inns of Court, he certainly had some connections and a visit to Middle Temple Hall is recorded in August, 1586, when he was congratulated having just returned from a voyage to the Spanish Indies. His ongoing connection to the inn can be found in two objects which remain at the hall today. The first is a ‘cupboard’, known as Drake’s Cupboard (cup board being an alternative for table), it is reputedly to have been made from a hatch cover off the Golden Hind (there’s a replica of this ship in Southwark). Replacing an earlier table, the cupboard is used in various ceremonial aspects of life at the Inn such as, for example, being the table on which members sign a book when they are called to the Bar. The second, meanwhile, is a lantern which hangs over the entrance to the hall and was reputedly taken from the poop deck of the ship (this was destroyed during the bombings of World War II and a replica now hangs in its place). Both items can only be viewed when the hall is opened to the public on rare occasions like the annual Open House London event. 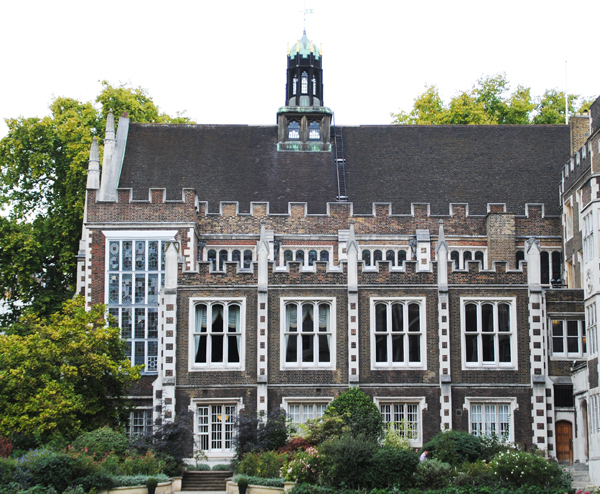 For more on Middle Temple Hall, see our earlier entry here and www.middletemple.org.uk. One of those somewhat confusing placenames where the ‘w’ is effectively silent, Southwark (pronounced something like Suh-thuck) is a sizeable district south of the River Thames and one of the city’s oldest areas. The area, which was settled as far back as Saxon times, takes its name from the Old English words suth or sud weorc which translates as “southern defensive work” and relates to the fact that the site is south of the City of London and at the southern end of London Bridge (the first bridge here was built by the Romans). While it was this name which was recorded in the Domesday Book of 1086, in the 900s the area was recorded as Suthriganaweorc which meant ‘fort of the men of Surrey’. 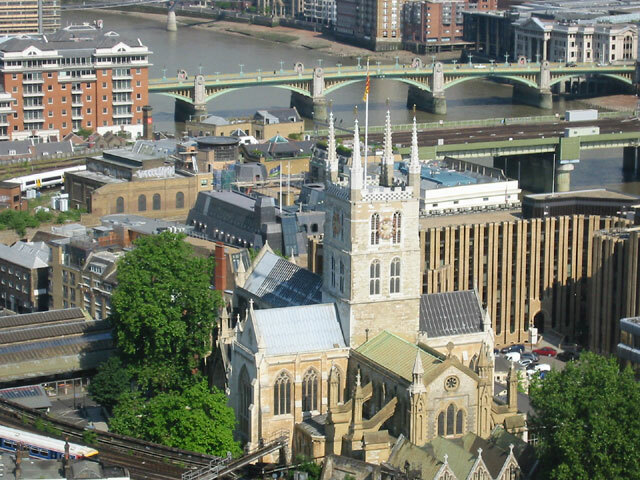 The name Southwark was also applied to borough which sat south of the river and still exists today – the Borough of Southwark. This in turn became shortened to just Borough, hence the name borough still exists as an alternative for part of Southwark even today (think of Borough Market and Borough High Street). Part of Roman Londinium, Southwark was effectively abandoned after the end of Roman rule and then reoccupied by Saxons in the late 800s when the ‘burh’ (borough) of Southwark was created. 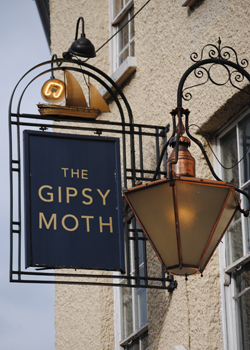 It developed considerably in the medieval period and became known for its inns (think of the pilgrim inn, The Tabard, in The Canterbury Tales). The area, particularly Bankside – part of the Borough of Southwark, also become known as an entertainment district with theatres and bear-baiting pits as well as a red-light district. It was also known for its prisons, in particular The Clink (controlled by the Bishop of Winchester), Marshalsea and the King’s Bench. The area was also a centre of industry – everything from brewing to tanning – and came to boast numerous docks and warehouses (when it also became a centre of the food processing industry). With the closure of the docks, it’s retail, tourism, creative industries and the financial services which are dominant in the area today. 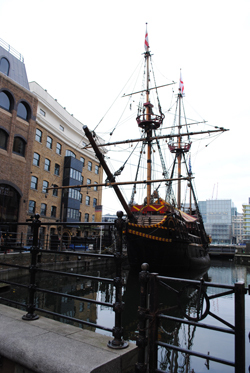 Landmarks are many thanks to the area’s long and colorful history (far too many to list in this short piece) but among major sites are Southwark Cathedral, Borough Market, and the George Inn as well as the Old Operating Theatre, Guy’s Hospital, and a replica of Sir Francis Drake’s ship, the Golden Hinde. Personalities associated with the area (again far too many to list here) include Geoffrey Chaucer, William Shakespeare and Charles Dickens. Last weekend saw thousands of people make their way to rarely opened properties across London as part of Open House London. Among the properties we visited was the Middle Temple Hall, one the finest example of a 15th century hall in London (if not the UK). The hall was built in the 1560s and early 1570s – by which time the Middle Temple, one of the medieval Inns of Court (more of which we’ll be talking about in an upcoming series), had already existed for about 200 years – and the hall which the Temple currently used, that of the former Templar Knights, was starting to fall apart. The new hall was constructed under the direction of law reporter Edmund Plowden, then Treasurer of the Inn, and funded by members of the Middle Temple. 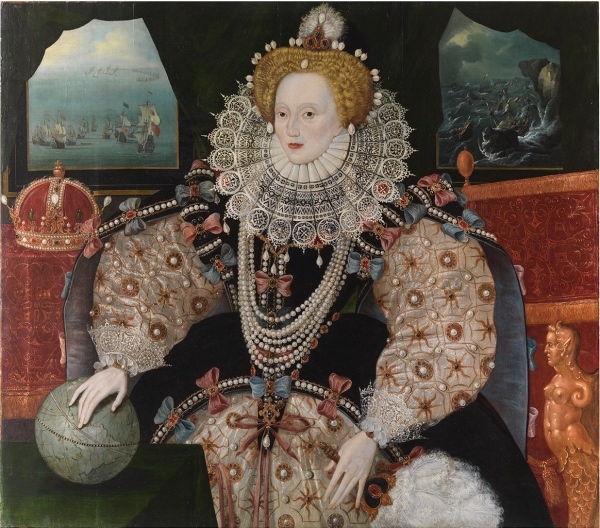 In use by about 1570, Queen Elizabeth I is, according to some stories, said to have dined there many times and it was in the hall that the first performance of Shakespeare’s Twelfth Night took place. While it suffered some damage in World War II bombings, the hall still looks much as it did in the late 1500s. It remains at the centre of the Middle Temple’s collegiate and social life and it is here that members are called to the Bar. 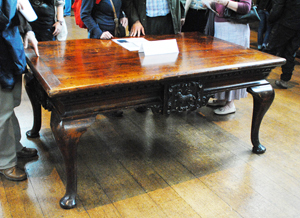 Among the notable objects inside are numerous paintings and stained glass memorials of people associated with the Inn (including Sir Walter Raleigh and numerous monarchs – from King Charles I to King Edward VII) as well as the High Table – a table made of three 29 foot long planks from a single oak, it is said to be a gift from Queen Elizabeth I – and the ‘cupboard’, a smaller table which was apparently made from the hatch cover of Sir Francis Drake’s ship, the Golden Hind. Late note: I should add that the Middle Temple Hall is not normally open to the public.